Huawei's Honor brand has announced that the anticipated Honor 7X will be formally available in India starting next week. Amazon India will exclusively begin the sale of the new Honor smartphone at 12pm on December 7. Earlier this week, the Chinese company revealed that it is set to launch the Honor 7X in the country on December 5. The company is hosting an event in London to announce the new launch. Amazon India began the registration process for the Honor 7X earlier this month. To persuade buyers for pre-registration, the online marketplace has offered a list of over 1,000 prizes including paid trips, smartphones, power banks, and headphones. Winners of these prizes will be announced on January 8, and the prizes will be awarded by February 5. "Reiterating our exclusive partnership with Honor, post successfully launching their flagship devices like Honor 6X, Honor 8 Pro, etc. We are now thrilled to offer our customers exclusive access to yet another impressive device, the Honor 7X," said Noor Patel, director of category management, Amazon India, in a press statement. As the successor to the Honor 6X, the Honor 7X features a 5.93-inch display with a full-HD+ (1080x2160 pixels) resolution in an 18:9 aspect ratio. The Android 7.0 Nougat-based smartphone runs Huawei's proprietary EMUI 5.1 custom skin. Under the hood, the smartphone has an octa-core HiSilicon Kirin 659 processor and sports a dual-camera setup on the rear with 16-megapixel and 2-megapixel image sensors. An 8-megapixel camera sensor is available on the front. Further, the handset packs a 3340mAh battery and has dual-SIM support with 4G network access. Huawei unveiled the Honor 7X in China last month in three storage variants. There are 32GB, 64GB, and 128GB storage options along with microSD card support (up to 256GB) through a hybrid dual-SIM configuration. India price details about the Honor 7X are yet to be announced. However, the 32GB Honor 7X is available in China with a price tag of CNY 1,299 (roughly Rs. 12,700), while its 64GB variant is priced at CNY 1,699 (approximately Rs. 16,600) and the top-end, 128GB variant is available at CNY 1,999 (approximately Rs. 19,600). All these variants have Gold, Aurora Blue, and Black colour options. 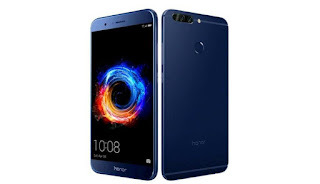 Considering the specifications of the Honor 7X, it would give a tough competition to options such as the Samsung Galaxy J7 Pro and the Xiaomi Mi A1.